Bring me Stanley, or at least Excitement! I remember reading a blog by a SFU Student called ‘The Canucks Almanac’ about 5 years ago. It was my first real exposure to blogging, and I read this guys site religiously. Mostly because he gave more commentary and insight than I could get from the regular media. One argument he made related to style of play. This was at the height of the West Coast Express hey day, and watching the misery of losing year after year early in the playoffs. The argument was, would you not rather play a defensive, boring style and win the Stanley Cup, than play the exciting edge of your seat offensive hockey and be knocked out in the first or second round every year. His point was that we do this for a Stanley Cup. My point of view is that I watch hockey because I love the game, and am devoted to my team. I am and always will be an advocate for Offensive Hockey. And I don’t mean, stop playing defence, but here’s my point. I love hockey, and I love watching 82 games of hockey every year. If it’s not entertaining to me, then I stop watching 82 games. I firmly believed that then, and this year of hockey is proving that I am not alone. I am not going to spend night after night watching games only to be bored to sleep. Watching all the games is a routine I’ve kept and maintained for countless years. Last year, I started noticing my excitement for games begin to slip. But I still watched every game, missing only a few due to necessary personal circumstances. This year, I have outright missed games, turned the TV off, and skipped periods due to boredom. And I’m apparently not the only one. How successful is the team if you can’t keep the interest of the average fan during the season, as they are bored. And only have strong support through playoff runs. What happens is you end up being the NJ Devils that don’t even sell out the first couple rounds of the playoffs. Bring back my West Coast Express, and my high flying defenceman. Bring back my gun slinging coach, and put me back on the edge of my seat. I want to be excited again. I don’t want to think it was a good effort, and we shut them down AGAIN for a 2-1 victory. I don’t want the other team to score 3 goals and know there is no hope we’ll win that game. I want to know we can score 5 goals in a game. 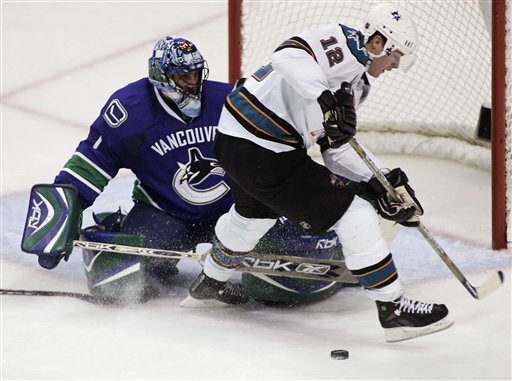 Between 2001 and 2003, the Canucks scored an average 259 goals per season. Since Vigneault has taken over and the defensive mentality instilled, the team is averaging 212 goals per season. That’s almost 50 goals lost every year. Think about it, that’s 50 fewer times you get to jump up and down in excitement. That’s 50 fewer times you do high fives, act a little crazy or have another beer. That’s 50 less beers!! I’m bored with my team. I watch almost as many games of other teams playing now as I do of my favourite home team. I love goals, I love other teams excitement and drive to score them. I love seeing the twine bulge as the puck hits the back of the net. I even like seeing behind Roberto because seeing a goal in a Canucks game is such an uncommon experience. I start to wonder what it’s like sitting on the other side of the TV as a fan of the other team. I think they are pretty happy scoring a goal against such a great goalie. It must be fun, and I pine for those days again. I wonder if someone told Henrik to actually shoot this year. His goal tonight was awesome, it reminded me of a Linden type shot off one knee. Anyways, at this rate, Henrik might actually hit double digits for goals this year! Okay, I’m being a bit facetious, he normally gets double digits, but he’s never hit 20. And right now he’s on pace for 27. Another win, but this time at home. On their third try, they were finally able to replicate at home what they have been doing on the road. The Sedins absolutely own Edmonton. Both are on track for record years. Their display in the second period for 2:15 of power play and even strength dominance was incredible. And Daniel’s goal to close off all that was awesome, he paused and picked his spot. Simply amazing to have that kind of patience. Sorry about the last games update. I wrote it, but didn’t post it. The Canucks have managed games of 4 and 5 goals this season. That is awesome stuff from a team that we didn’t expect any offense from. And the team had 5 different scorers tonight which is equally as impressive. So much for no secondary scoring. I had contemplated doing something different this year, but think I will just stick with The Good, The Bad, & The Ugly. Unless anyone else has any other suggestions for me. Sedins got 2 points each. Krajicek’s goal from Daniel was a play that I had not seen from the power play before. I was happy to see them do something a bit different there and be rewarded for it. I love watching hockey in HDTV. I am so thankful the CBC have more that just 1 HD set of equipment now. Sportsnet still has a long way to go on this. I hardly watch anything that isn’t on an HD channel anymore. I looked for the hockey game for 5 minutes before I remembered it would probably be on the regular Sportsnet channel. 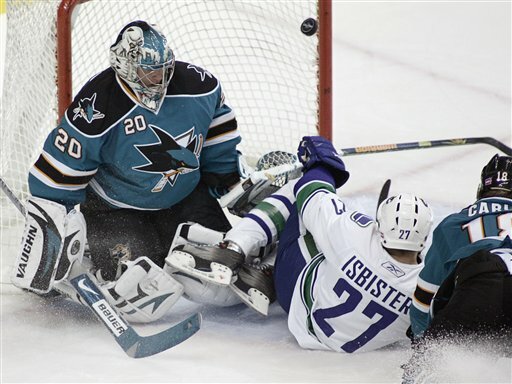 Unfortunately, the Canucks had to play their first game of the season against a team that had already been through 3 full periods, an overtime, and a shootout. And the first 12 minutes of the game showed and proved to be the difference.